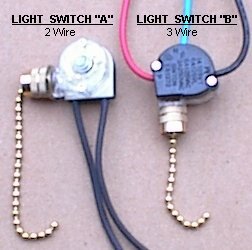 Ceiling Fan Parts - Pull chain switch for ceiling fans. The single layer pull chain switch, for the ceiling fan motor, has 4 positions for the wires. Each position is marked with a small number or letter directly above each wire. The positions will usually be marked as: L, 1, 2, 3. This switch comes in four different rotor patterns. 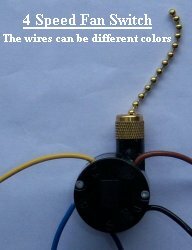 Call us with the wire colors and the position of each wire. The double layer pull chain switch, for the ceiling fan motor, has 8 positions for the wires. The markings will be the same as the single layer switch. This switch comes in three different rotor patterns. Call us with the wire colors and the position of each. The 4 speed ceiling fan switch will have 5 wires and the positions will be marked as: L, 1, 2, 3, 4.